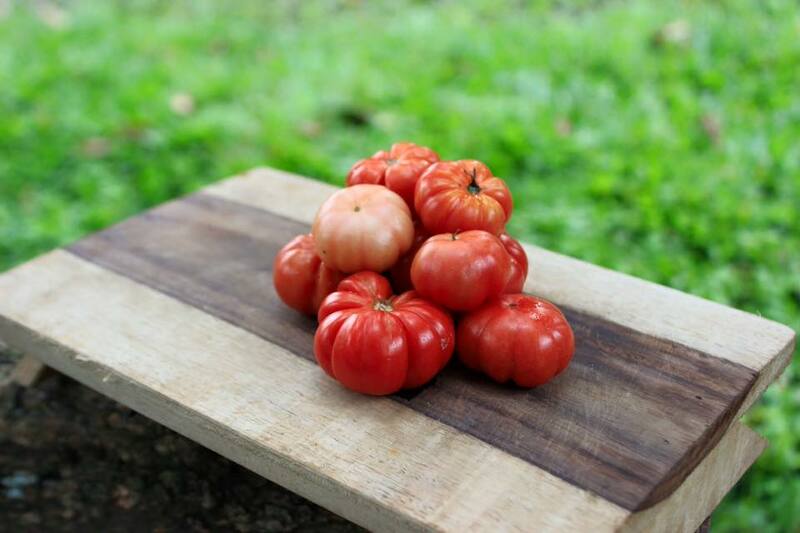 For Indonesians, tomatoes are one of the most important ingredients in many dishes. They are present in almost every meal and contain many vitamins and other antioxidants in high amount and thus are good for healthy living. Tomatoes (Lycopersicon esculentum L.) originated from the central and south Americas. Having so many nutritious benefits, this crop is higly important in the world of horticulture. It is also known to prevent pancreatic cancer because of its likopen content. Likopen is present in tomatoes to bind to free radicals. Other nutrients include beta carotene, which helps maintain healthy eyes and prevent early blindness. With high fiber and water content, it can be consumed daily. In addition to the benefits for inside the body, tomato offers help for healthy appearance. Its Vitamin A content promises full and strong hair, as well as healthy teeth. The Vitamin E prevents acne that often unsightly. Make 2×1 m2 beds. Add dolomite if the soil pH is high because generally tomato prefers acidic soil. Dolomite addition can also improves marginal soil. After adding dolomite, plow fields. Apply 10 liters per bed of composted manure by broadcasting. Soil is ready for planting in three days. There are a couple of two important factors in selecting fruits for seeding; ie. ripe and healthy peel. Obtain the seeds and wash the mucousal layer. Sow the cleaned seeds on a container with a sandy medium for three days. The main advantages of sand in the medium are increased aeration and drainage, which promote faster growth, and ease of seedling transfer. Transplant the growing seedlings into polybags. Plant seedlings on beds 13 days after sowing. Make planting holes with diameters about seven to ten centimers and seven centimeters deep in the middle of the beds. The distance between the holes is 30 cm. Take out seedlings out of polybags. Place seedlings in the holes and cover with soil. Water sufficiently. Weed regularly. Remove unhealthy or dry leaves because they may promote plant rot. Apply fertilizer two weeks after planting. Dissolve 10 ml of liquid organic fertilizer and one tablespoon into five liters of water. Apply approximately 250 ml of mixture for every plant. After the initial application, the fertilizer mixture should be applied once a week and stopped when fruits start appearing. Control pest infestation and diseases by spraying plant based pesticides. Tomatoes can be harvested at around 70 to 12o days after planting. After initial harvest, fruits can be picked once a week. Ripe fruits are marked by the increased size and red coloring. Other harvest ready signs are yellowing and drying of leaves and stalks. Harvest should be done manually by twisting one fruit at a time in the early morning or late afternoon.